The 2nd Charlottesville Tweet Up was held last Friday at Rapture on the Downtown Mall and it was a blast – an excellent way to spend an hour or so on a Friday afternoon, meeting friends “IRL” – In Real Life – an often infrequent experience in this online world. Nearly twenty folks showed up – quite a few more than attended July’s meetup. I’m grateful to have the opportunity to share time and conversations with these folks. I feel more closely tied to Charlottesville thanks to the relationships I am building through Twitter. 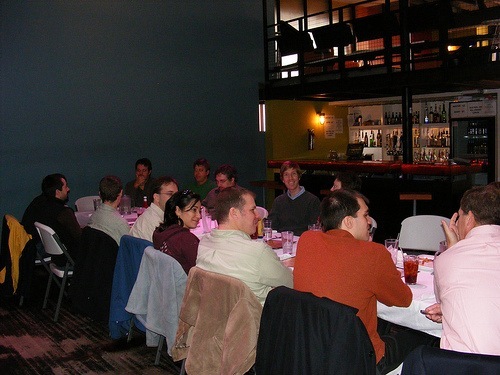 Mark your calendars – Charlottesville Tweetup 13 March at Rapture(?) – either lunch or happy hour. – Hi, I’m Jim. (conversation ensues) Five to ten minutes (or more) later – Oh, I’m a Realtor. – Hi, I’m a Realtor (and my name is Jim). Part of the new paradigm shift in marketing with social media is this – rather than talking to or at people, being present is part of the battle for consumers’ confidence and trust. Give back first. Business will follow. I’m struggling with this myself – I recently set up Twitter accounts for three of my blogs – each serves a different real estate market – and I initially thought that I would tweet from each one. Almost immediately after I wrote and published the respective blog posts announcing the new accounts for readers to follow, I realized the simple truth about Twitter from a (my) user’s perspective – I don’t want to follow a blog. I want to follow the person who writes the blog. So – I’m already considering abandoning my three new accounts and keeping the focus on my account – @JimDuncan – because I suspect readers/followers feel the same. While I’m not fully prepared to abandon the Twitter accounts for RealCrozetVA, RealCentralVA or RealWaynesboroVA, but I have come to this simple conclusion – I wouldn’t want to have lunch with @RealCentralVA, but I’d be inclined meet @JimDuncan. 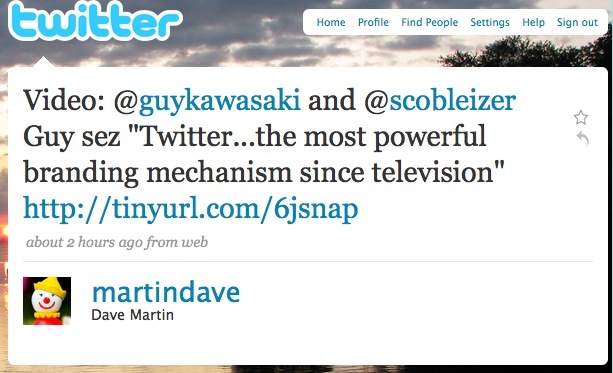 For the uninitiated – What’s Twitter? Twitter’s not for everyone, and that’s just fine. Jim – Regarding the multiple twitter accounts question: This is something I go back and forth a lot on as well. At Cloudbrain, we have several, different, products: FixTunes (music organization), Blastogo (group texting), CurbPlaces (real estate) and more. What if someone was only interested in news / details about one product and not the rest? In your situation: what if I am only interested in Charlottesville real estate news and not Crozet news (or not your personal family tweets)? I realize people want to follow people (and not brands) but this is still a strategy I go back and forth on. I think that in your situation, having a catch-all account (you) which people could follow, in addition to specific accounts per each product would work. In my situation, my offering remains the same – I’m “selling” my expertise, my knowledge and my personality – and that is pretty consistent across geographic areas. That, and I’m the same everywhere, whether in Crozet, Waynesboro or Charlottesville. I think that (with the caveat that I deliberately don’t write about my kids) the knowledge that I have kids is enough for most of my readers/followers. When they see me tweet that I’m “Playing Dad tonight” I think that humanizes me as a person and professional – setting boundaries, and being able to abide by them (as well as having priorities sorted out) are key things that my clients have come to respect and understand. In your case, from my point of view, I’d definitely follow you and might follow Curbplaces. I’m in the same twitter boat. I recently opened my own brokerage and I thought it’d be a great idea to give that brokerage a voice on Twitter. Now, I’m not so sure. If nothing else, it’s just a pain to log out of one and into another and to try to build up followers for the brokerage. I did recently run across a utility that allows you to set up tweets ahead of time and I may use that for the Brokerage to talk about itself a few times a week. You’re right about people following people as opposed to brands because people are more interesting. Also, since Delicious Real Estate has nothing fun to give away except blog posts or stories about the brokerage, the appeal isn’t very wide. I’m coming down on the side of one twitter account for a real person: I’ve done an informal study and survey of twitter accounts that I (and friends) follow-back (after first being followed) and the result is obvious: I almost always follow-back an account that follows me if the account has a real name attached to it but almost never follow accounts that are only company brands. There is no company I care enough about to “follow”.